As rainfall brings new life on land, dotting hills with wildflowers and causing trees to blossom in pinks and whites, similar transformations are happening along the rocky islands, sandy beaches, mudflats, and bays of the California coast. March marks the beginning of the pupping season for the Pacific harbor seal, or Phoca vitulina. From March to June, mothers come onto land or “haul out” along the Pacific coast from Alaska to Baja California, ready to give birth to their pups. These seals can typically be seen in small groups, but can sometimes gather in colonies of up to 500 individuals at established colony sites. Unlike California Sea Lions, Pacific harbor seals are true seals, meaning that they have no ear flap, or pinna, and instead have a visible ear canal above their eye. They are members of the pinniped clade, which includes walruses, true seals, and eared seals. They are typically white or gray in color, with black spots, but can also have partially or fully reddish coats, due to iron oxide deposits on their hair shafts. This coloration is common for harbor seals living in the San Francisco Bay. The seals can live for 25-30 years, and grow to be 5 or 6 feet in length, weighing a maximum of 300 pounds. This not seem small, but they are compared to their elephant seal relatives, whose males, or bulls, can weigh up to 5,500 pounds! Because Pacific harbor seals are smaller, they need to spend more time on land as they cannot stay for too long in the frigid waters of the Pacific; they do not have a thick enough blubber layer to keep warm. Harbor seals spend about 7 hours a day sunning themselves on land in the fall and winter months, and this number increases during pupping season, when mothers will spend around 10-12 hours per day on land, nursing pups and resting. 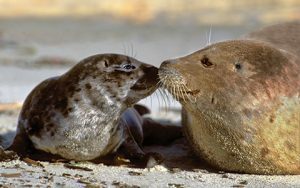 The mother spends almost all her time with the pup, even taking it with her to hunt, because, unlike most other pinnipeds, harbor seal pups can swim at birth. Harbor seals and elephant seals cannot rotate their pelvises, so they move their bodies across the ground in an inchworm fashion. In contrast, sea lions can rotate their pelvis forward, walking on all four limbs. This give them access to steep, rocky shoreline inaccessible to harbor seals. Harbor seals eat mostly meat, including fish such as sole, flounder, sculpin, hake, cod, and herring, along with octopus and squid. They are classified as an apex predator, with great white sharks as one of their few predators. Apex predators are vulnerable to change in ecosystems, because they depend on the entire ecosystem below them to survive. Because of this, they can be studied to determine the condition of marine ecosystems. Since the Marine Mammal Protection Act was passed in 1972, which outlawed the harm, harassment, or killing of marine mammals, harbor seal populations have grown and steadied, with a current estimated global population of 500,000 individuals. Because harbor seals cannot move with great agility on land, they are very sensitive to human interaction. After repeated distress at a preferred haul out site, harbor seals may abandon it entirely. Mothers may even abandon their young if they are disturbed enough. On their own, the pups have a low chance of survival, as they are more susceptible to disease and stress. If you see these seals in person, maybe along the coast of Pt Reyes National Seashore, maintain a distance of 300 feet, backing away slowly from any alarmed seals. This will allow both humans and harbor seals to enjoy our beautiful watershed. “Harbor Seals.” National Parks Service, U.S. Department of the Interior, 22 Feb. 2018, www.nps.gov/pore/learn/nature/harbor_seals.htm. Lowry, L. “Phoca Vitulina .” Phoca Vitulina (Common Seal, Harbor Seal, Harbour Seal), 28 Feb. 2018, www.iucnredlist.org/details/17013/0. “Marine Mammal Protection Act (MMPA).” NOAA Fisheries, NOAA Fisheries, 14 June 2013, www.nmfs.noaa.gov/pr/laws/mmpa/. “Pacific Harbor Seal.” The Marine Mammal Center, The Marine Mammal Center, www.marinemammalcenter.org/education/marine-mammal-information/pinnipeds/pacific-harbor-seal/?referrer=https%3A%2F%2Fwww.google.com%2F.